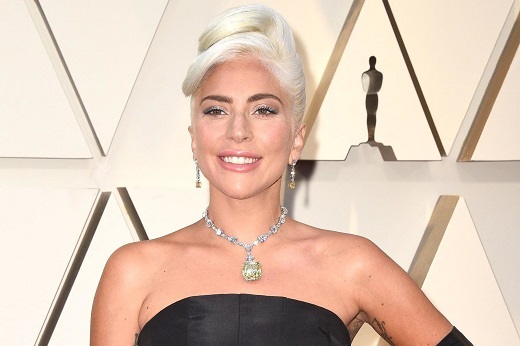 RAPAPORT... Actress and singer Lady Gaga sported a 128.54-carat yellow diamond and platinum Tiffany necklace at the 91st Academy Awards show Sunday night. The Oscar winner wore the 141-year-old cushion-cut Tiffany Diamond — which originated in the Kimberley mines in South Africa — was last seen on Audrey Hepburn at the publicity shoot for the 1961 movie Breakfast at Tiffany’s. It’s the first time the diamond has featured at an awards-show red carpet, Tiffany noted. “Lady Gaga is the ultimate creator, innovator and rule-breaker, and I’m thrilled that she will be wearing the legendary Tiffany Diamond on the awards-show red carpet for the first time since it was discovered,” Tiffany chief artistic officer Reed Krakoff said Sunday. The A Star is Born performer also wore fancy-vivid-yellow and white diamond earrings. A number of other celebrities were spotted wearing platinum jewelry at the awards show. Amy Adams debuted a platinum Cartier clip brooch with diamonds, while Laura Harrier sported a diamond, emerald and platinum Bulgari necklace. Jennifer Hudson, Sarah Paulson, Helen Mirren and Laura Dern all chose platinum-and-diamond Harry Winston jewels.